Most sand-and-gravel deposits in Ohio were formed directly or indirectly by continental glaciers, which occupied up to two-thirds of the state during the recent Ice Age, about 2.5 million years to 11,700 years before the present. The largest inland outwash deposits in Ohio are present along a 100-mile long stretch of the Great Miami-Mad River system between Bellefontaine and Cincinnati and along a 90-mile long stretch of the Scioto River Valley between Columbus and Portsmouth. 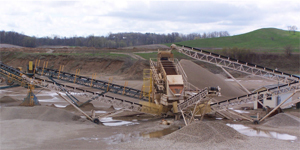 State records for sand-and-gravel production began in 1904, when 1.4 million tons were reported to have been produced. Ezra Neer knew a good thing when he started his business in 1927. The following year in 1928 he hired his first employee and designed and built his first screening and crushing plant. In 1960 Arden Neer Sr. joined the company followed by the hiring of Arden Neer Jr. in 1985 and then Andy Neer in 1988. For the last 88 years Neer’s Sand and Gravel has remained a family owned and oper-ated business serving Logan and surrounding counties. Today, brothers Arden Jr. and Andy are partners and have eight employees, two of which have 25 years each with the company and one employee with 38 years at Neer’s Sand and Gravel. If you are in the market for washed sand and gravel, Neer’s is the only producers in Logan County. 100% of the water used to wash their products is from recycled water. 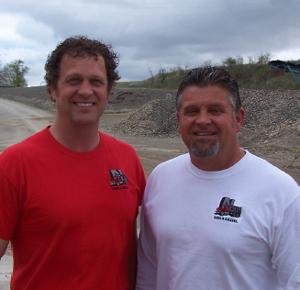 Arden Jr. and Andy stand behind fast and friendly service with products such as concrete sand and asphalt sand, mason sand gravel for driveways, septic systems, back fill, landscaping, processed topsoil and baseball diamond mix. “We have always strived to produce the best product at the lowest affordable price no matter how big or small the job is,” says Arden Jr.
We’d also like to congratulate Neer’s on an ongoing award for job safety, through the Mine Safety and Health Administration (MSHA). This award is given to companies for hours worked without any injuries. 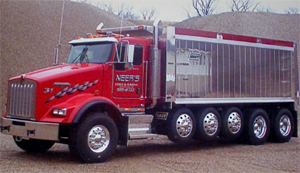 Neer’s Sand and Gravel has gone 25 years without an injury! “Safety is a big priority for our employees and their families,” says Arden Jr.
Ezra was born here, raised his family here and started Neer’s Sand and Gravel. “We really enjoy being a part of this community and the people that live here. We recognize the Logan County Chamber of Commerce as a way to stay connected to the community,” adds Neer. We would like to recognize Neer’s Sand and Gravel for their commitment to the Chamber of Commerce, for their membership the last 35 years and especially for their loyalty to Logan County for the last 88 years. Congratulations and be on the lookout, Neer’s are currently rejuvenating their social media to include a fresh website, Facebook page, twitter and instagram.